In today's competitive global marketplace, Application Management Services (AMS) have become increasingly important for international companies to comply with country-specific markets and regulations, and ensure high-quality operations of SAP solutions in a sustainable, cost-effective manner. Our client wanted to extend their SAP footprint across India and South America and realized the challenges of supporting and maintaining high levels of service. The additional cost and complexity of supporting this environment internally became even more challenging as the user base continued to grow. 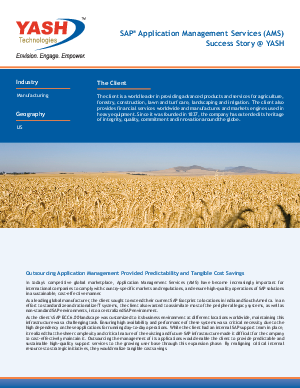 Find out how outsourcing the management of their SAP environment provided cost predictability.